To pray truly, we can learn from the traditions of others. There are rich treasures in each and every Christian tradition that we can draw on without compromising our own Christian tradition, experience and spirituality. The Orthodox insights into and traditions about prayer have influenced many Anglicans, including Archbishop Michael Ramsey, Archbishop Rowan Williams and Bishop Simon Barrington-Ward. Many in the Western world have been helped to pray through the books of Metropolitan Anthony Bloom. The practice of the Jesus Prayer (Η Προσευχή του Ιησού) is one of the rich treasurers of the Orthodox tradition that can help each of us to develop our own practice of prayer. The Jesus Prayer is a short, simple prayer that has been widely used, taught and discussed throughout the history of Eastern Christianity. In order to enter more deeply into the life of prayer and to come to grips with the Scriptural challenge to pray unceasingly, the Orthodox tradition offers the Jesus Prayer – which is called the ‘Prayer of the Heart’ (Καρδιακή Προσευχή) by some Church Fathers – as a means of concentration and as a focal point for our inner life. However, the earliest verifiable mention of the Jesus Prayer is in the writings of Saint Diadochos of Photiki (400-486), a work found in the first volume of The Philokalia (Η Φιλοκαλία), a collection of texts on prayer compiled between the 4th and the 15th centuries. In that collection, Saint Diadochos ties the practice of the Jesus Prayer to the purification of the soul. He also teaches that repetition of the prayer produces inner peace. The Jesus Prayer is also described by Saint John Cassian (died 435) in his account of the repetitive use of a passage of the Psalms. The use of the Jesus Prayer is recommended by Saint John Klimakos (Ἰωάννης τῆς Κλίμακος, 525-606), a monk of Mount Sinai, in The Ladder of Divine Ascent, and in the work of Saint Hesychios (?8th century), Pros Theodoulon, found in the first volume of The Philokalia. In The Way of a Pilgrim, the anonymous pilgrim recounts his desperate longing ‘to pray without ceasing.’ He wanders, with a Bible in hand, in search of someone who can teach him. Eventually, the pilgrim finds a wise monk who becomes his spiritual father or staretz (стáрец). This monk instructs the pilgrim in prayer, and gives him The Philokalia to read. This story in The Way of the Pilgrim became familiar to many readers in the west in the 1960s through the popularity of JD Salinger’s novel, Franny and Zooey, when the distressed young woman describes the Jesus Prayer to her boyfriend over lunch in a restaurant. But what are the Scriptural and theological foundations of the Jesus Prayer? The Apostle Paul urges the Christians of Thessaloniki to ‘pray without ceasing’ (I Thessalonians 5: 1). In his letter to Rome, he instructs the Christian community there to ‘be constant in prayer’ (Romans 12: 12). He not only demands unceasing prayer on the part of the Christians in his care, but he practices it himself. ‘We constantly thank God for you’ (I Thessalonians 2: 13), he writes, and he comforts Timothy with the words: ‘Always I remember you in my prayers’ (2 Timothy 1: 3). Whenever the Apostle Paul speaks of prayer in his letters, two Greek words appear repeatedly: πάντοτε (pantote), which means always; and αδιαλεπτος (adialeptos), meaning without interruption or unceasingly. Prayer, then, is not merely a part of life which we can conveniently lay aside if something we deem more important comes up. Prayer is all of life, must be all of life. Prayer is as essential to our life as breathing. But how can we be expected to pray all the time? How can we fit more time for prayer into our already overcrowded lives? Let us listen to a similar theme in The Cry of the Thief Crucified by the Russian composer Pavel Grigorievich Chesnokov (1877-1944), who suffered greatly under Stalin – when the Cathedral of Christ the Saviour, where he was the last choirmaster, was torn down, he stopped writing altogether. The tenor singing here is the Russian Evgeny Akimov (1910-1949). Play: ‘The Cry of the Thief Crucified’ by Pavel Chesnokov (Track 13, Authentic Russian Sacred Music). The Jesus Prayer is a prayer in which the first step taken on the spiritual journey is recognising my own sinfulness, my essential estrangement from God and the people around me. The Jesus Prayer is a prayer in which I admit my desperate need of a Saviour. For ‘if we say that we have no sin in us, we deceive ourselves, and the truth is not in us’ (I John 1: 8). 3, He describes the third and final level as prayer of the heart. At this stage, prayer is no longer something we do but who we are. Such prayer is a gift of the Spirit, and is to return to the Father as the Prodigal Son did (Luke 15: 32). The prayer of the heart is the prayer of adoption, when ‘God has sent the Spirit of his Son into our hearts, the Spirit that cries that cries “Abba, Father!”’ (Galatians 4: 6). 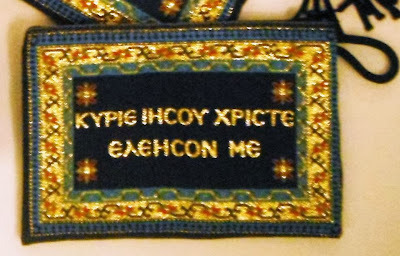 In the Eastern tradition, the Jesus Prayer is said or prayed repeatedly, often with the aid of a prayer rope (Greek κομποσχοίνι, komboschini; Russian чётки, chotki). It may be accompanied by prostrations and the sign of the cross, and sometimes it is integrated into the liturgical life of monasteries. I try each year to spend a day in prayer at a monastery. Last year, this included visits to Mount Athos, to the Monastery of Vlatadon in Thessaloniki, and to the Monastery of Saint George in Karydi in western Crete. 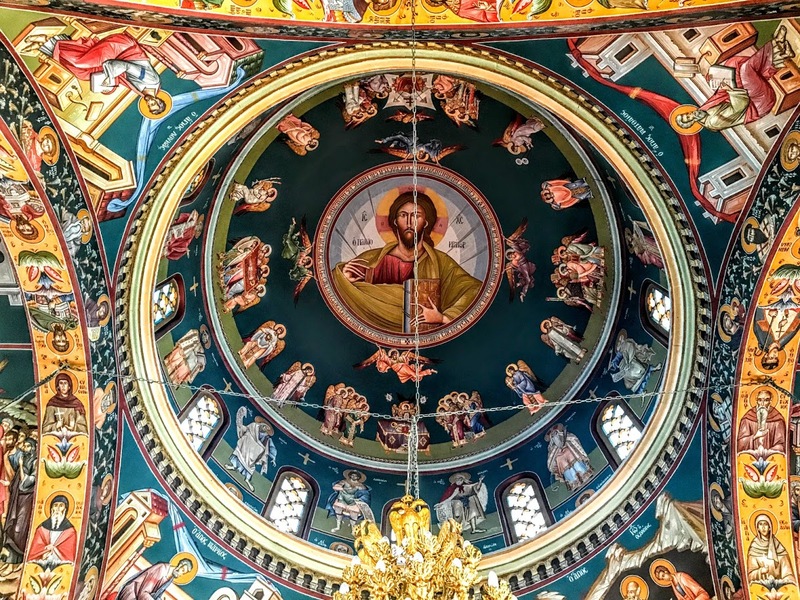 But for many years, this was an annual visit to the Patriarchal Stavropegic Monastery of Saint John the Baptist at Tolleshunt Knights, near Maldon in Essex. It involved an early start, catching a bus from Cambridge at 6 a.m. to be there in time for the Divine Liturgy. The community was founded in an old Anglican rectory in 1958 by Archimandrite Sophrony Sakharov (1896-1993), with the help of Metropolitan Anthony (Bloom). 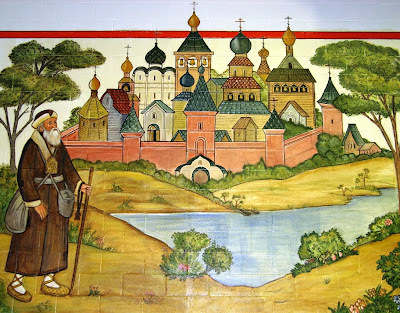 When he was founding the monastery, Father Sophrony wanted to be sure his community would not just have outward conformity, but also focus on inner asceticism. The typicon of the monastery consists of the repetition of the Jesus Prayer about four hours a day (from 6 to 8.30 a.m. and 5.30 to 8 p.m.), as well as the serving of the Divine Liturgy three or four times a week. 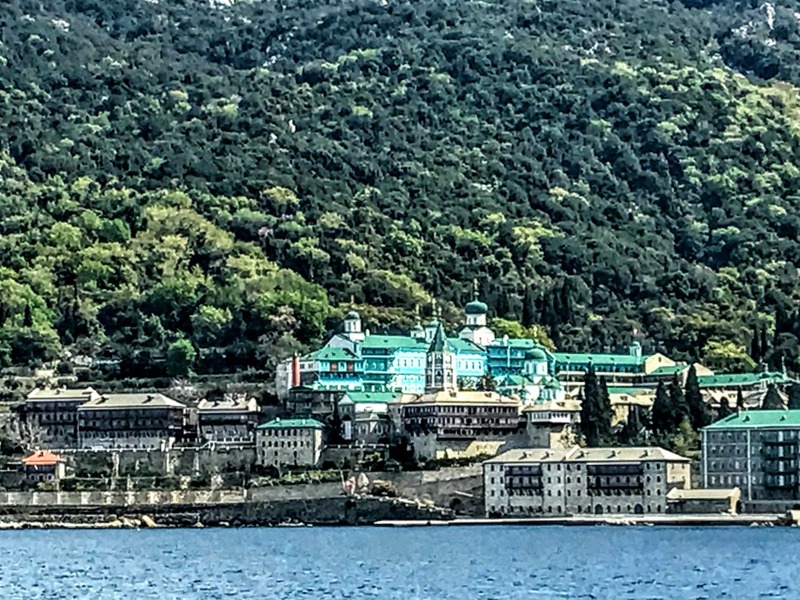 The monastery was founded by is found inspiration in Elder Sophrony, and he was inspired to introduce this practice of the Jesus Prayer from his experiences as a monk on Mount Athos monk, and by the lives of Saint Silouan, Saint Nicodemus and Saint Paisius Velichkovsky. The American Orthodox blogger and writer, Frederica Mathewes-Green, gives a vivid and realistic example of how the person who uses the Jesus Prayer constantly prays throughout the day and deals with ordinary, everyday thoughts and distractions. To pray does not mean to think about God in contrast to thinking about other things, or to spend time with God in contrast to spending time with our family and friends. To pray means to think and live our entire life in the Presence of God. 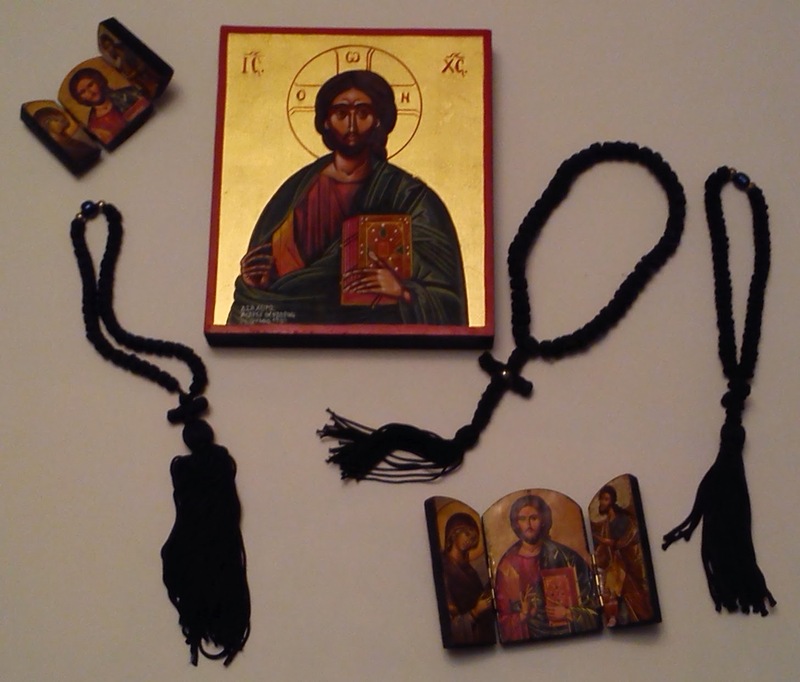 The practice of the Jesus Prayer is one of the rich treasurers in the Orthodox tradition offers to those who would pursue the task of developing their own practice of prayer. Here, as with Saint Seraphim of Sarov, the prayer of the heart is much more than an arcane spiritual practice. Rather, its genius is that it summarises all that the scriptures say, the whole of life is to be ‘in Christ’ and the Spirit. The practice of the Jesus Prayer is integrated into the mental ασκήσεις (ascésis) undertaken by the Orthodox monk in the practice of Hesychasm. This mental ascesis is the subject of The Philokalia. And so, perhaps, a brief note on the Hesychast tradition may be helpful. Hesychasm (Greek ἡσυχασμός hesychasmos, from ἡσυχία hesychia, ‘stillness, rest, quiet’) is an eremitic tradition of prayer in Eastern Orthodoxy, practised (Greek: ἡσυχάζω, hesychazo, ‘to keep stillness’) by the Hesychast (Greek: Ἡσυχαστής, hesychastes). 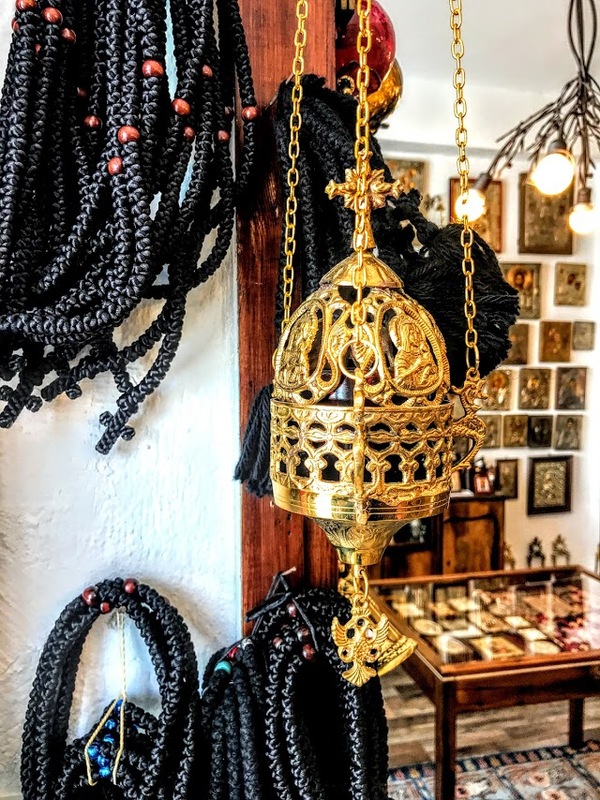 The tradition dates back to both the Cappadocian Fathers and the Egyptian anchorites in the Western Desert, although the traditions strongest roots can be traced from the 6th to 8th centuries and The Ladder of Divine Ascent written by Saint John of Sinai (523–603). The term Hesychast is particularly associated with the integration of the continual repetition of the Jesus Prayer into the practices of mental ασκήσεις (ascésis) already used by hermits in Egypt. By the 14th century on Mount Athos, Hesychasm refer to the practices associated with the Jesus Prayer. 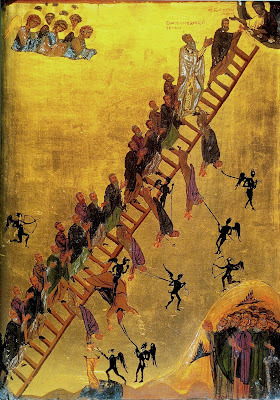 The books used by the Hesychasts include The Philokalia, a collection of texts on prayer and solitary life written from the 4th to the 15th centuries; The Ladder of Divine Ascent; the collected works of Saint Symeon the New Theologian (949–1022); and the works of Saint Isaac the Syrian (7th century or 8th century). Hesychastic practice may involve specific body postures and be accompanied by very deliberate breathing patterns. However, these bodily postures and breathing patterns are treated as secondary both by modern Athonite practitioners on Mount Athos and by the more ancient texts in The Philokalia, the emphasis being on the primary role of Grace. 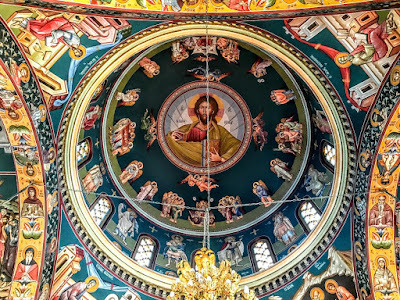 Hesychasts are fully inserted into the liturgical and sacramental life of the Orthodox Church, including the daily cycle of the Divine Office and the Divine Liturgy. However, Hesychasts who are living as hermits may have a very rare attendance at the Divine Liturgy and might not recite the Divine Office except by means of the Jesus Prayer, which often happens on Mount Athos. The Hesychast practices acquiring an inner stillness, ignoring the physical senses and rejecting tempting thoughts. In solitude and retirement, he repeats the Jesus Prayer, ‘Lord Jesus Christ, son of God, have mercy on me, a sinner.’ He prays the Jesus Prayer ‘with the heart’ – with meaning, with intent, ‘for real.’ He never treats the Jesus Prayer as a string of syllables whose ‘surface’ or overt verbal meaning is secondary or unimportant. He considers bare repetition of the Jesus Prayer as a mere string of syllables, perhaps with a ‘mystical’ inner meaning beyond the overt verbal meaning, to be worthless or even dangerous. While he maintains his practice of the Jesus Prayer, which becomes automatic and continues 24 hours a day, seven days a week, the Hesychast rejects all tempting thoughts, paying extreme attention to the consciousness of his inner world and to the words of the Jesus Prayer, not letting his mind wander in any way at all. The practice of the Jesus Prayer is in the mind in the heart, free of images. The stage of practice known as ‘the guard of the mind’ is a very advanced stage of ascetical and spiritual practice, and attempting to accomplish this prematurely can cause very serious spiritual and emotional harm to the would-be Hesychast. ‘The guard of the mind’ is the condition in which the Hesychast remains as a matter of course throughout his day, every day until he dies. It is from the guard of the mind that he is raised to contemplation by the Grace of God. The Hesychast usually experiences the contemplation of God as light, the Uncreated Light of the theology of Saint Gregory Palamas. The Hesychast, when he has by the mercy of God been granted such an experience, does not remain in that experience for a very long time, but he returns ‘to earth’ and continues to practise the guard of the mind. The Uncreated Light that the Hesychast experiences is identified with the Holy Spirit. Experiences of the Uncreated Light are allied to the ‘acquisition of the Holy Spirit.’ The highest goal of the Hesychast is the experiential knowledge of God. In the 14th century, the possibility of this experiential knowledge of God was challenged by a Calabrian monk, Barlaam, who asserted that our knowledge of God can only be propositional. However, the practice of the Hesychasts was defended by Saint Gregory Palamas. It must be said that there are many warnings that seeking after unusual ‘spiritual’ experiences can itself cause great harm, ruining the soul and the mind of the seeker. Such a seeking after ‘spiritual’ experiences can lead to spiritual delusion in which a person believes himself or herself to be a saint, has hallucinations in which he or she ‘sees’ angels, Christ, etc. This state of spiritual delusion is in a superficial, egotistical way pleasurable, but can lead to madness and suicide, and, according to the Hesychast fathers, makes salvation impossible. 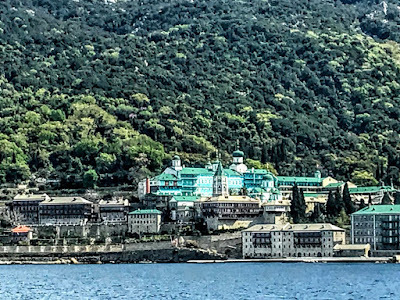 Mount Athos is a centre of the practice of Hesychasm, and the most important centre of monastic life in the Orthodox world today. There has been a recent revival in the fortunes of many of the monasteries on the Holy Mountain, with new monks arriving from Cyprus, Romania, Russia and Australia. But the mountain is loved among the Orthodox for nurturing great writers in spirituality and on the life of prayer. 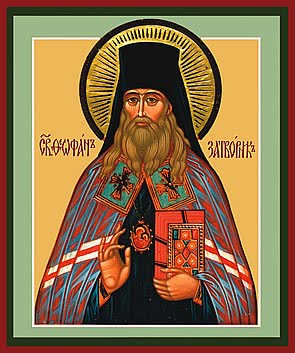 Three of the better known of these writers in the 20th century were Saint Silouan (1866-1938), his disciple Archimandrite Sophrony (1896-1993), and Father Joseph (died 1959). Although some of these great writers also lived the lives of hermits, they gathered many followers, and were particularly known for their practice of the Jesus Prayer. A prayer rope is a loop made up of complicated knots, usually made of wool, used by Eastern Orthodox Christians and Eastern Rite Catholics to count the number of times they have prayed the Jesus Prayer: ‘Lord Jesus Christ, son of God, have mercy on me, a sinner.’ Historically it typically had 100 knots, although prayer ropes with 50 or 33 knots can also be found in use today – with the number 33 signifying the years of Christ’s earthly life. There is typically a knotted cross at one end, and a few beads at certain intervals between the knots. Longer prayer ropes frequently have a tassel at the end; its purpose is to dry the tears shed because the deep sorrow for one’s sins. 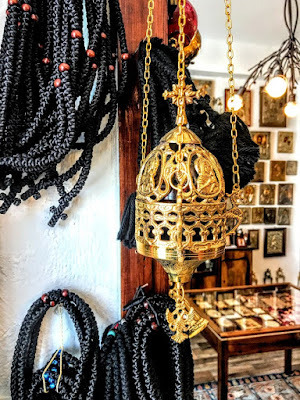 It is said that the Prayer Rope has its origins from the Father of Orthodox monasticism, Saint Anthony. He started by tying a leather rope for every time he prayed his Kyrie Eleisons, or Lord have Mercies, and the Devil came and would untie it to throw his count off. He then devised a way, inspired from a vision by the Theotokos (Mother of God), of tying the knots so that the knots would constantly make the shape of the cross. That is why Prayer Ropes today are still tied by seven little crosses being tied over and over. The Devil could then not untie it because the Devil is vanquished by the sign of the Cross. Others attribute its origin to Saint Pachomius in the 4th century as an aid for illiterate monks to accomplish a consistent number of prayers and prostrations. Monks were often expected to carry a prayer rope on their left wrist almost constantly, to remind them to pray constantly in accordance with the Apostle Paul’s injunction: ‘Pray without ceasing’ (I Thessalonians 5: 17). In some Russian Orthodox service books, certain liturgies can be replaced at need by praying the Jesus Prayer a specified number of times, anywhere from 300 to 1,500 times, depending on the service being replaced. In this way prayers can still be said even if the service books are unavailable for some reason. The use of a prayer rope is a very practical tool in such cases, simply for keeping count of the prayers said. 3, you may want to sit silently and meditate on some of the Scripture passages we have been discussing. (Metropolitan) Anthony Bloom, Living Prayer (Springfield IL: Templegate, 1966), pp 84-88. Paul Evdokimov, Ages of the Spiritual Life (Crestwood NY: Saint Vladimir’s Seminary Press, 1998). RM French (translator), The Way of a Pilgrim (London: SPCK, 1977). (Father) Lev Gillet (‘A Monk of the Eastern Church’), The Jesus Prayer, with a foreword by Kallistos Ware (Crestwood NY: Saint Vladimir’s Seminary Press, 1987). Frederica Mathewes-Green, Facing East (San Francisco: Harper, 2006), pp 144-145. Frederica Mathewes-Green, The Jesus Prayer: the ancient desert prayer that tunes the heart to God (Brewster MA: Paraclete Press, 2009/2010). E Kadloubovsky, GEH Palmer (eds), Writings from the Philokalia on Prayer of the Heart (London: Faber and Faber, 1992). GEH Palmer, Philip Sherrard, (Metropolitan) Kallistos Ware (eds), The Philokalia (London: Faber and Faber, 1979, 4 vols). (Brother) Ramon SSF, Praying the Jesus Prayer (Basingstoke: Marshall Pickering, 1988). JD Salinger, Franny and Zooey (various editions). (Father) Sophrony, On Prayer (Crestwood NY: Saint Vladimir’s Seminary Press, 1998). (Bishop) Simon Barrington-Ward, The Jesus Prayer (Oxford: BRF, 2007 ed). (Bishop) Simon Barrington-Ward and (Brother) Ramon SSF, Praying the Jesus Prayer Together (Oxford: BRF, 2001). (Metropolitan) Kallistos Ware, The Power of the Name: the Jesus Prayer in Orthodox Spirituality (London: Marshall Pickering, 1989).